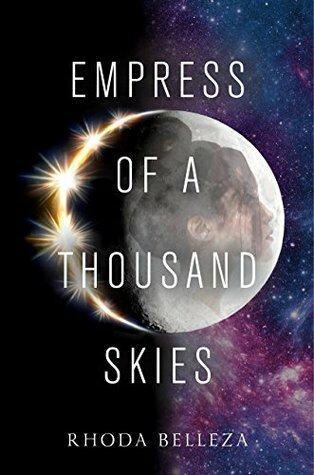 Unfortunately, Empress of a Thousand Skies was another YA novel that received a little too much hype for my taste. I definitely didn't think it was a bad book, don't get me wrong. It just didn't really have any special qualities that made it stand out. The characters were interesting, but I didn't really connect with them, and the story line was just barley enough to hold my attention. I am a huge fan of sic-fi YA books, so I was extremely pumped when I was chosen to feature this book for Storygram Tours. After reading the first few chapters, I was a little disappointed with the pace of the story. It also seemed like the writer tried a little too hard to include bizarre names and languages throughout the story. I am all about diving into a different world, but for some reason I just couldn't get a handle on the names and the strange cussing... were those cuss words? I don't know. The characters were interesting and I really enjoyed Aly the most out of everyone. Rhee often seemed too headstrong and more concerned about revenge and not so concerned about whether or not is was warranted. I also felt like there were a lot of loose ends and vague storylines that left me questioning what was happening at times, which may have been because I would totally zone out while reading... never a good sign. All in all, it was interesting but a bit drawn out. I think the book could have been condensed a decent amount and maybe it would have held my attention a litter better. I'll still plan to read the second book because I'm completely incapable of leaving a series unfinished, but I won't be shouting about Empress of a Thousand Skies from the rooftops. I often have a very different opinion than others when it comes to YA, so please give this novel a try even though it wasn't a great read for me. I hope you enjoy it more than I did! I hope the next one is better for you.